From tech to energy, these stocks are built to last. Owning a stock for a decade or more may seem like a long time, but it's actually the best way to generate market-beating returns in the long term. And if you buy the right stock, you can generate incredible returns without doing a thing. Today, I think investors should be looking at Alphabet (NASDAQ:GOOG)(NASDAQ:GOOGL), NextEra Energy Partners (NYSE:NEP), and Apple (NASDAQ:AAPL) as great buy-and-hold investments. Each has their own competitive advantage and has a business that's built to last. Alphabet's Google is central to the internet for millions of people (myself included), and the company has built an insanely profitable business on the search engine at its foundation. The company uses data from everything from our search history to emails to deliver relevant ads and has built a massive advertising business on that. I think search and Google will continue to grow, but the other businesses in Alphabet are what make this a long-term winner. GOOG Revenue (TTM) data by YCharts. Alphabet's investments in new businesses will keep it relevant for decades to come. Waymo is a leader in self-driving vehicles, Google Fiber is a leading high-speed internet provider, and Calico is developing health and well-being solutions. These are on top of equity investments Alphabet has in Slack, Airbnb, Uber, Lyft, Stripe, and many more. Even if Alphabet's core business begins to fade -- which we see no sign of today -- the investments in strong businesses both within and outside of Alphabet will make this company a great stock for years to come. If you're not familiar with renewable energy yieldcos, NextEra Energy Partners is a company worth looking into. It owns 3.7 gigawatts (GW) of renewable energy assets that have contracts to sell electricity to utilities with an average of 18 years remaining. What's great about renewable energy projects is they act like bonds for a yieldco buying them. NextEra Energy has a strong track record of buying projects that are accretive, or grow the dividend over the long term, to the current $1.54 per share dividend, which yields 3.8%. Plus, the low dividend actually makes it easier for NextEra Energy Partners to acquire projects using a combination of newly issued debt and equity because a low dividend yield makes its cost of capital lower than competitors'. There aren't many successful yieldcos in the market today, but NextEra Energy Partners has been a winner because it's backed by a big utility (NextEra Energy), it has a large pipeline of projects that can be dropped down from the utility, and it has a low dividend yield that makes accretive acquisitions possible. That's a recipe for success in energy today. There's never been a cash machine quite like Apple. 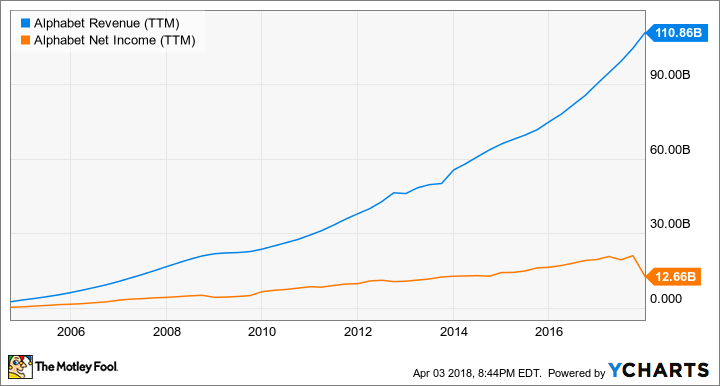 In the past year alone, the company generated $52.3 billion in free cash flow, and that flow of cash doesn't show any signs of slowing. The iPhone drives the bulk of the company's business and there are now hundreds of millions of the smartphones in circulation, but other Apple products -- from Macs to iPads to AirPods -- play a role in Apple's business, too. The Apple ecosystem is really something no company can match today and it's locked hundreds of millions of consumers around the world into Apple products. Once you're within it, it's easy to add more and more products, eventually adding services like Apple Music, iCloud storage, and soon streaming TV, as well. Apple's incredible products and resulting cash flow are great, but let's not forget about its net cash balance of $181.2 billion. That's a balance sheet that can withstand any market turbulence or competitive pressure in tech. Apple is built to last for the long term. The market can be volatile and unsettling at times, but Alphabet, NextEra Energy Partners, and Apple are all built to withstand turbulence. They're stocks I would be comfortable owning for a decade or more.